Finding a photographer that will bring your vision to reality is essential. I work closely with clients to make sure their expectations are not just met but exceeded. Most prints available in: 8×12, 12×18, 16×24, 24×36, 40×60. Contact me for custom sizes and print ideas. What phase of the project will we be photographing? Are there distinct design elements that need to be highlighted? Is the focus on interior or exterior shots or a combination of both? Where is the location of the project? What is the timeframe for shooting? Details of the project are enumerated. Copyright and licensing requirements are established. Licensing is something that is common among architectural and/or commercial photographers. The license is a legal agreement between the photographer and the client that sets forth usage rights and timelines. A license does not allow the client to share photos with third parties unless there is a prior agreement. Individual licenses will cover the types of photos each client needs, the way they intend to use them and the expected time of use. If flying within five miles of an airport, prior approval is needed from the FAA. Waivers are available depending upon location. However, it can take up to 90 days for waivers to be approved. Temporary Flight Restrictions may prohibit photographers from flying drones in certain areas at certain times. Unless a waiver is obtained ahead of time, a drone operator may only fly during daylight or civil twilight which is typically 30 minutes before sunrise and 30 minutes after sunset. We are at the mercy of the weather when it comes to any type of photography, but this is especially true with drones. Visibility and cloud ceiling requirements must be met, wind conditions can prohibit flight and precipitation will ground a drone. 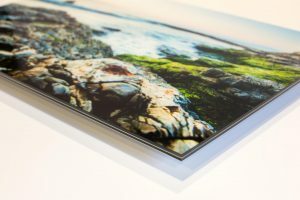 Made by infusing dyes directly into aluminum, HD metal prints are a great modern alternative to display art. These have a beautiful vibrancy and luminosity. They are lightweight, durable, easy to care for and are ready to hang. 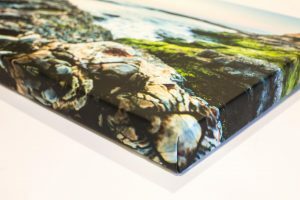 Each canvas is made using the highest quality fine art canvas, hand stretched onto heavy wood stretcher bars. Every piece has a matte UV protective varnish making it easy to clean and increases color longevity. Standard depth is 1-½”, but is available in ¾” and 2″ depths. Di-Bond is a mounting substrate commonly used in galleries and museums. It is an aluminum composite that is is extremely rigid and lightweight. 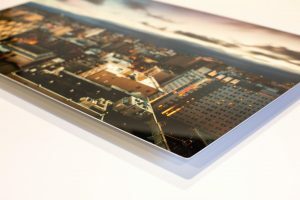 It is very sturdy even at large sizes, has a UV protection, and comes ready to hang. 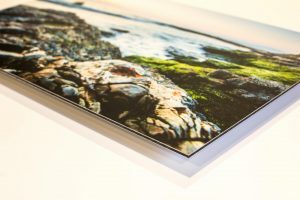 TruLife acrylic face mounts offer a luminescent glow unlike any other kind of photo product. It is the absolute best acrylic available and allows for extremely deep black and rich colors. It is anti-reflective, abrasion resistant, and blocks 99% of UV light.